Before comparing Eli Manning to his older brother Peyton, we must take a step back from the Super Bowl this week. Eli Manning. What words do you immediately think of when you think of Eli? Perhaps you perceive Eli Manning as Peyton’s younger brother, nothing more, nothing less. Maybe you think of Eli as that guy who miraculously wiggled out of a sack three times in one play, scrambled outside the pocket, and launched a prayer down the field in Super Bowl 42 that was eventually snatched by some no-name, obscure wide receiver with the help of a helmet and some stick ‘em glue. Or maybe you think of Eli Manning as Archie Manning’s son. Perhaps, just maybe, it’s time for you to think about Eli Manning as a 2 time Super Bowl Champion, 2 time Super Bowl MVP, the most successful quarterback in road playoff games in NFL history, future hall of famer, and the best Manning to ever play the game of football. Yeah, I said it. Eli’s brother, Peyton, is the greatest regular season quarterback in NFL history. There’s no other quarterback that’s ever played the game that I would rather have than Peyton Manning if the goal were to go 13-3 every year and earn the number 1 seed in the postseason. Under Peyton’s reign, the Colts set an NFL record by winning 12 or more regular season games for 7 consecutive seasons. But the goal isn’t to own the regular season, fill up the stat sheet, and set a myriad of statistical records. The goal, as in every sport, is to be the last team standing at the end of the year with the title of champion. Period. Just look at Dan Marino. If Marino were able to bust through just once and hoist the elusive Lombardi Trophy, he would likely be regarded as the greatest quarterback in NFL history. 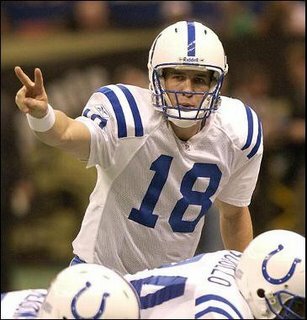 During his illustrious NFL career, Peyton Manning has played in 19 playoff games, all as a member of the Indianapolis Colts. His record in those games in 9-10, hardly anything worth significant merit. Manning has a career postseason passer rating of a pedestrian 79.7. While the Colts did breakthrough to win the Lombardi trophy in the 2006-2007 season under Manning’s direction, Peyton had a mediocre showing in the postseason. During the Colts run to the title in the ’07 playoffs, Manning threw 7 INT’s and only 3 TD’s. He sported a passer rating of an underwhelming 61.7. Manning and the Colts again reached the Super Bowl in 2009 after a record setting 14-2 season. However, Peyton failed to win his second ring as he threw a crucial interception in the waning minutes to seal Indy’s fate. Manning did have an exceptional 2009 postseason (9 TD’s, 1 INT), however many believe Peyton choked in what many dubbed as the most important game of his career. If Peyton doesn’t throw the pick to Tracy Porter and the Colts win Super Bowl 44, Peyton Manning is the greatest quarterback of all time. Eli, on the other hand, seems to shine brightest when the pressure is on. Eli boasts extremely impressive career playoff numbers (21 TD’s, 7 INT’s) and is 8-3 as a starter in the postseason. He’s also tied for most game-winning drives in NFL playoff history with the great Joe Montana. Oh, and he’s won the Super Bowl…twice, both times against the mighty Patriots. This is Eli at his finest. Notice under 2 minutes left in fourth quarter. Not only is Eli one of the most clutch players to ever play the game, he’s one of the most consistent players in the NFL today. The Giants have not had a losing season since Eli Manning has been the starting quarterback for New York. There is no doubt in my mind; Peyton Manning is a first ballot hall of famer. No questions asked. However, he doesn’t have the hardware that his brother Eli does. Before you make your decision, I’ll ask you this: who would you rather under center with two minutes left in the game, trailing by 4? To me, the answer is obvious: it’s Eli. This entry was posted in Football, Home, National, Uncategorized and tagged Colts, Eli Manning, Giants, Peyton Manning, Super Bowl. Cooper Manning is …… getting no love but if he uses the Manning name it might now guarantee him some “pull” with the ladies . Oh to be a sibling in that family . I’d go with Eli as well. And if you would have told me I’d do that five years ago? I would’ve told you to book a padded room for yourself.